The effects of climate change on economic development in the coastal zone cannot be ignored in future coastal zone management plans. 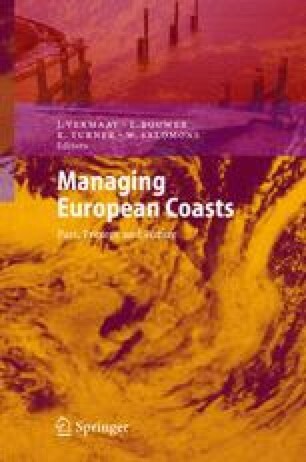 This chapter reports the outcome of the group discussion centred round the three questions posed by Nicholls and Klein on how the coastal zone can be effectively managed in the future. The first question asked how we can marry together the human and natural values of a system in the upcoming decades. The results of the discussion highlighted the utility of using scenarios to obtain good management plans that take into account the three provisions of human safety, economic development and ecological integrity while still achieving a situation of sustainable development. The second question addressed the tools required to achieve these management goals and discusses the role of public participation and media communication. The third question asked what proactive strategies can be used to effectively manage the coastal zone in the 21st Century and an example of the Humber estuary management plan is given. It is proposed that a robust and flexible integrated coastal zone management plan is the only effective way to manage the coastal zone in a sustainable manner in the uncertain face of climate change.